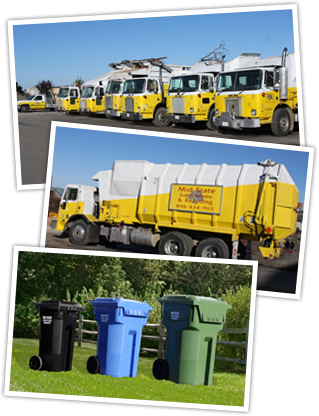 Mid State Solid Waste & Recycling provides residential and commercial trash and recycling collection to many rural or unincorporated areas of northern San Luis Obispo County, as well as the Templeton Community Services District. We collect both comingled recyclables and green waste throughout our service area. We also offer roll-off boxes (cargo containers), and storage bin rental for a variety of purposes, including large scale green waste collection, construction and demolition cleanup, general cleanup, and storage. For available sizes and to get a price quote, please visit the roll-off boxes page. For more information about our waste and recycling services, or to inquire about renting a roll-off container or bin, please call us at (805) 434-9112 M-F. You can also request an email quote for our roll-off containers on the Roll-Off Container & Storage Bin page. Green waste and recyclables collected locally are processed right at our Paso Robles / Templeton facility. Green waste materials are then converted to wood chips and compost, which are available for pickup or delivery at our facility. We also accept construction and demolition recyclables, including brick, asphalt, drywall, concrete and more. If you’re in need of construction or demolition recycling services, please visit our sister site, North County Recycling.